Daphne wears sleepers. A lot. She spends about 98% of her time in a sleeper. Dan and Monika wore sleepers a lot, too, but the proportion of time spent wearing sleepers has steeply increased with each child. 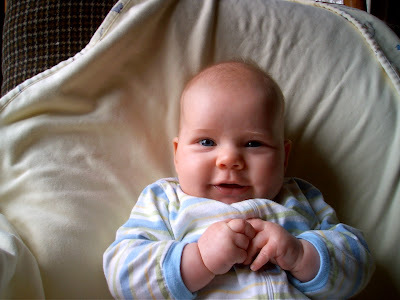 (1) Sleepers are comfortable; the fabric is soft and there's no elastic waist band to cut into a baby's tummy. The way I see it, my kids will have the rest of their lives to try squeezing into jeans. Plus, I think jeans look funny on babies. (2) Because they don't crawl up like pants, sleepers keep babies' legs warm. (3) Sleepers eliminate the need for socks. 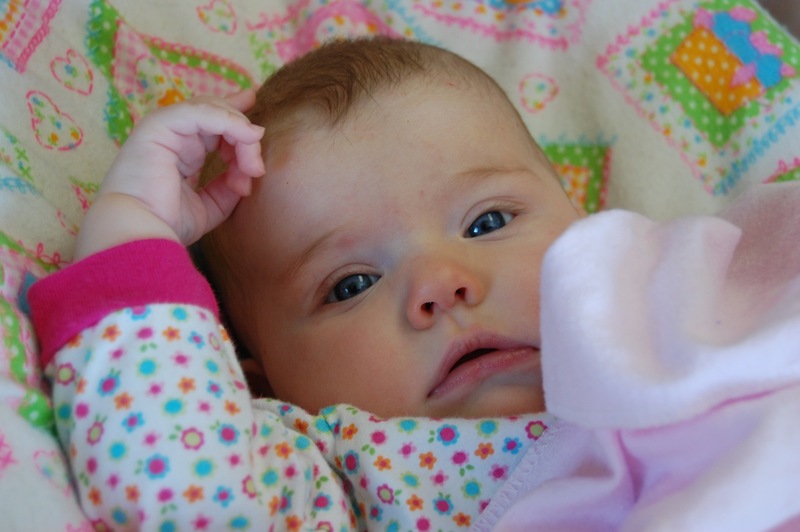 Keeping socks on babies is a ridiculous endeavor. 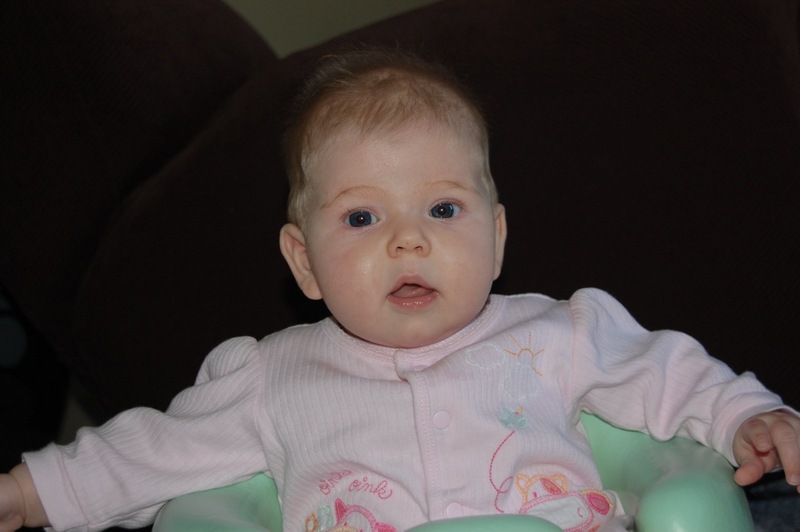 Sadly, my older babies' sleeper days ended long ago and Daphne's will come to an end one day, too. But what if we never outgrew our sleeper days? There would be no muffin tops. Sure, we might all look like Teletubbies, but we'd be comfortable and covered. There would be no more digging through the laundry basket trying to find a pair of socks because your daughter refused to wear the first pair you set out for her. There would be no need to decide if this shirt looked good with those pants. Picking out clothes would take a fraction of the time. Plus, lots of sleepers these days come pre-accessorized, so we wouldn't need a jewelry box full of baubles. Life would be whole lot simpler. 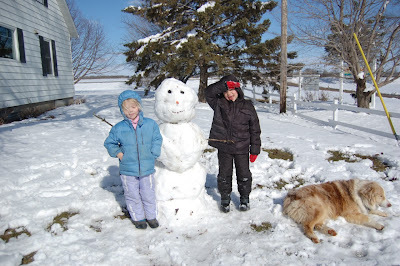 I told myself I wasn't going to write about all of this April snow. 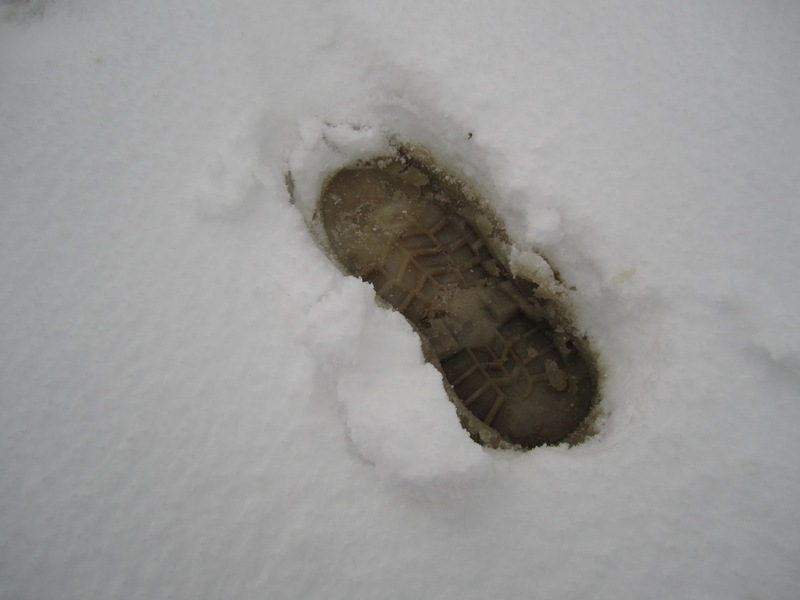 This snow on top of mud was not something I found humorous or wanted to remember. But then last Friday happened and I decided that someday I'll want to remind my kids that, yes, it does snow in April. Sometimes it snows a lot in April. I ran into our friend Eddie at the grocery store yesterday and he said that back in 1950, farmers didn't put a seed in the ground until a month from now. I've been trying to keep a positive attitude about our white landscape. I keep telling myself, "We need the moisture." I've convinced myself that, if April showers bring May flowers, then it must also be true that April snow will help the flowers grow. I found out last week that Glen's dad planted a whole bunch of tulip bulbs in one of our flower beds last fall. The flower bed that's still buried under a pile of snow. Nonetheless, tulips are one of my favorite flowers and just knowing that they'll pop up sooner or later gives me hope. I am so ready for some color in our yard. And some color in the pastures, too. 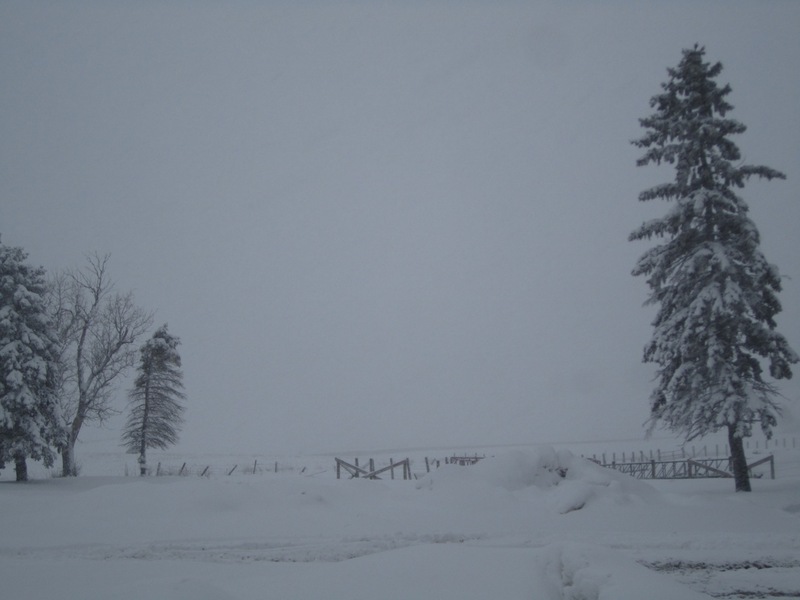 Glen said he thinks that all this snow will help the pastures green up quickly once the snow finally melts. I hope he's right. 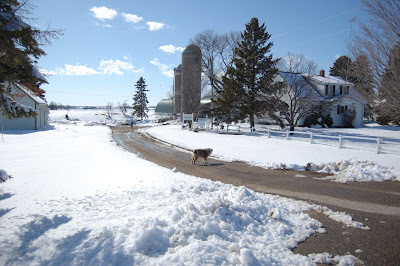 Last year, we put the cows out to pasture on April 12. Yes, I know, it was an exceptionally early spring, but we normally put them out during the last week of April or first week of May. We're now in the last week of April and the pastures are nowhere near ready to welcome the cows. I'm looking at our milk cow pasture in the picture above. Can you see it? My positive attitude about the snow was tested last Friday. At 1:40 a.m. that morning, I woke up to the sound of someone pounding on our front door. I looked at the alarm clock and knew right away it was our milk truck driver. 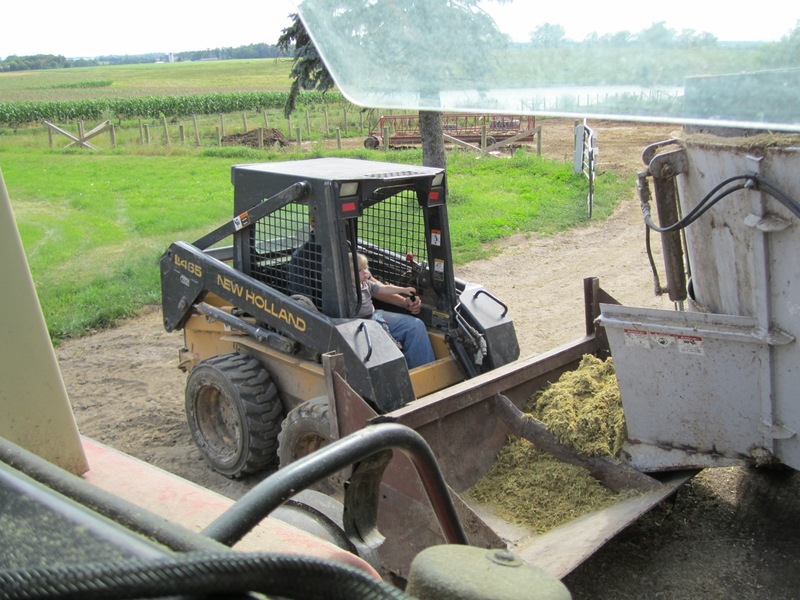 (Our milk gets picked up at 1:45 a.m. to go down to Woodbury, Minn. for bottling.) I shook Glen until he woke up and whisper-yelled, "There's someone knocking on the door." The milk truck was stuck in our driveway. 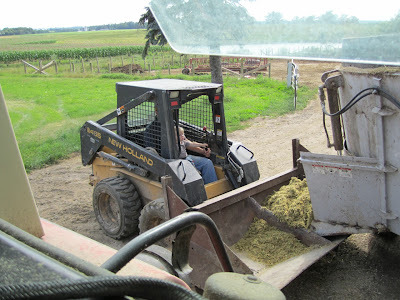 It took an hour for Glen and the driver to get the truck unstuck enough to drive over to the milk house, load the milk, and then get the truck out of the driveway. The snow day and the sunshine gave us a chance to do something we had been meaning to do all winter: build our first ever snowman. 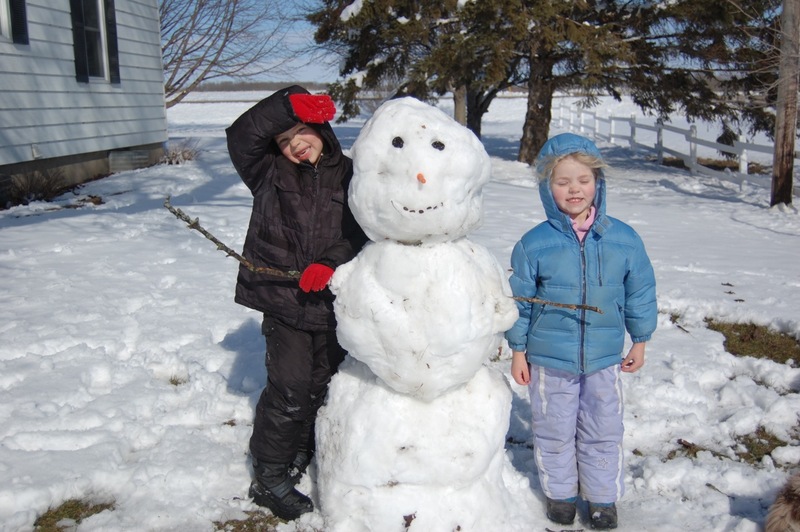 I feel supremely better as a parent, now that we didn't let winter pass without making a snowman. 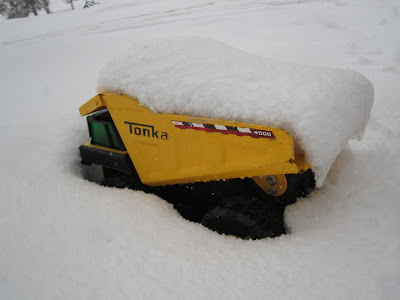 And, instead of being bitter about the snow this month, I'm thankful for one last opportunity to have some winter fun with Dan and Monika. 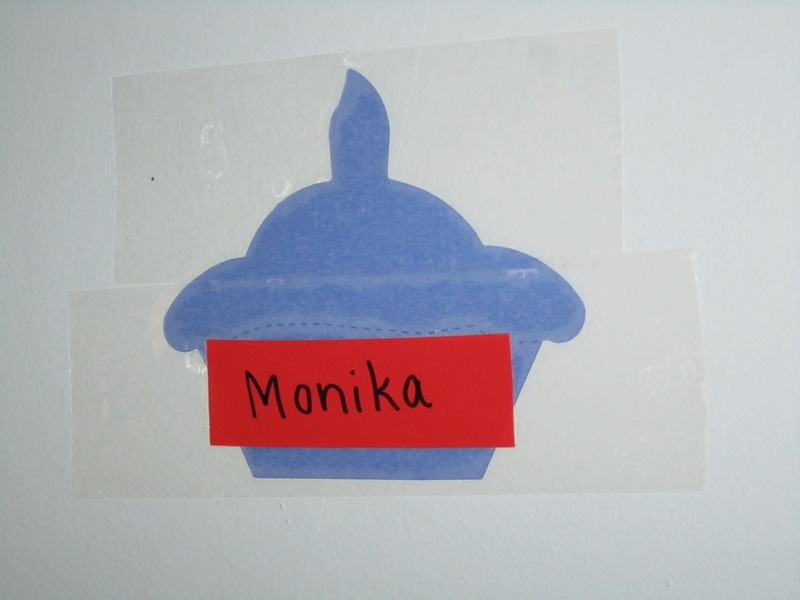 When Monika started pre-school last fall, the students in her class were each assigned a shape along with their name. Since many of these three-year-olds couldn't recognize their names at the beginning of the year, the shapes were used to label the students' mailboxes, coat hooks, and spots on the floor. 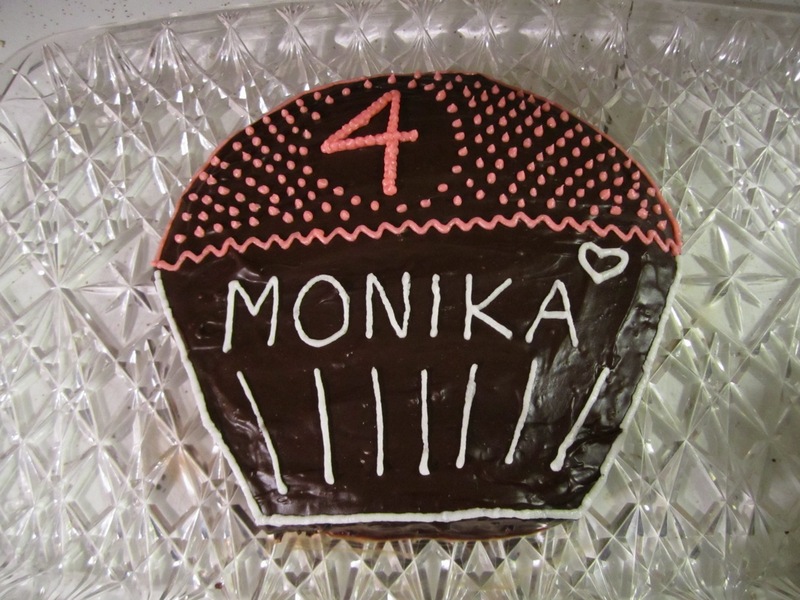 We find it all too fitting that Monika's assigned shape is a cupcake. 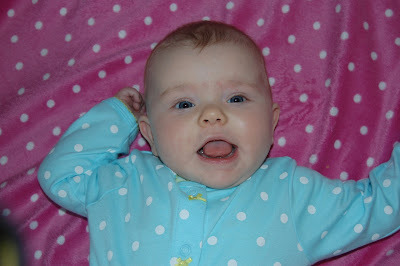 And even though our little girl can now recognize her name, she's still a little cupcake. So, when it came time to plan Monika's 4th Birthday Party, I wasn't one bit surprised when she said she wanted cupcakes. She also said she wanted a Dora cake, but I wasn't about to attempt that, so I went with the cupcake idea. 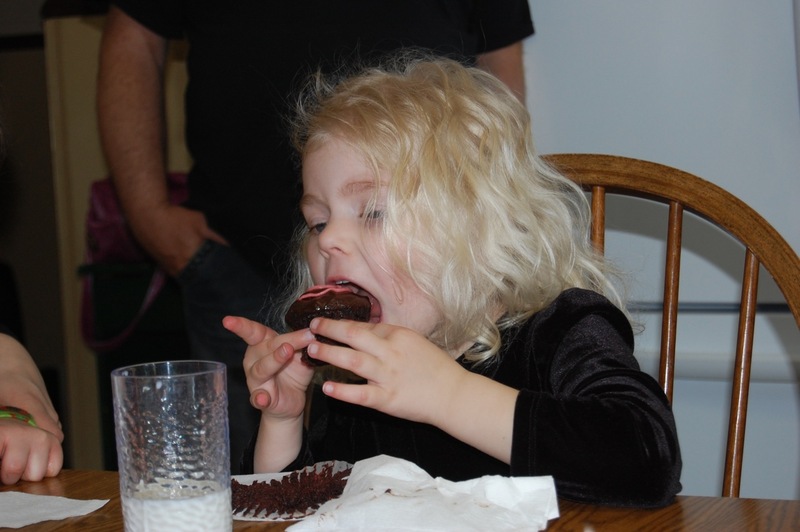 One night while I was finishing up chores in the barn, the idea for how to make a cupcake cake popped into my head. I'm not good at postponing an idea, so I tried it the next day. I baked a box of chocolate fudge cake mix in two round cake pans. Once the cakes were cool, I made three cuts to shape the cake. That part was super easy! 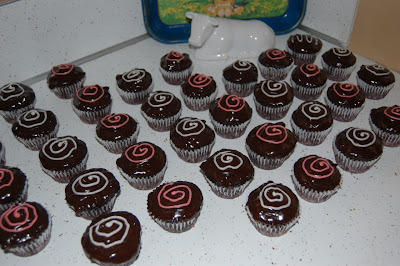 I frosted both the uncut cake and the cupcake-shaped cake with Chocolate Fudge Frosting (recipe below). 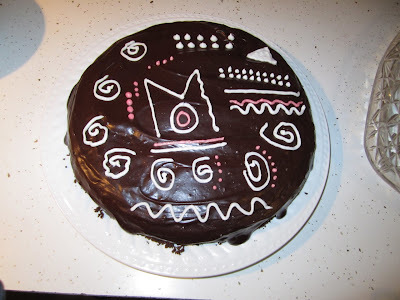 Then I used the uncut cake for decorating practice. 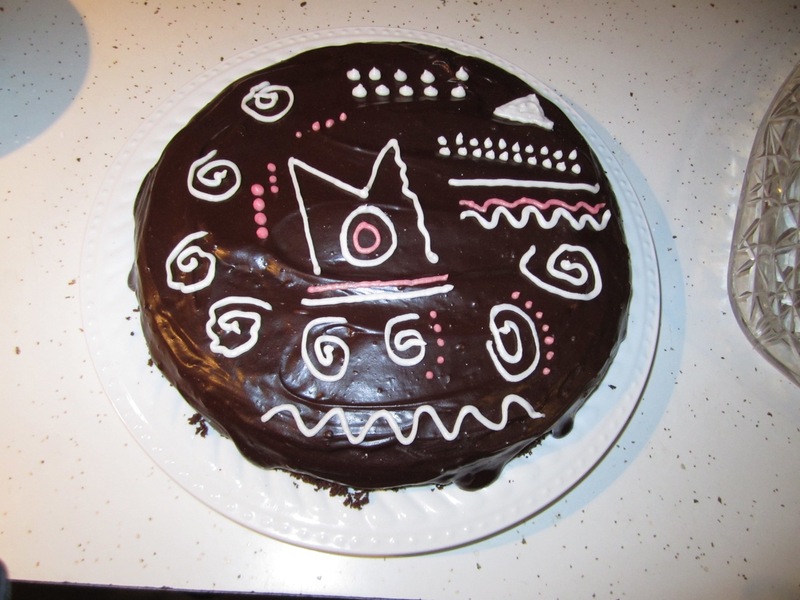 It's been a long time since I've decorated a cake and I don't have any cake decorating tools. (I used my dad's in the past.) So I improvised and used a plastic sandwich bag. I made a batch of One-Bowl Buttercream Frosting (recipe below), divided it and tinted a portion pink. I filled two zipper-top sandwich bags with white and pink frosting and then snipped a tiny hole in one corner. Once I had practiced enough to feel comfortable, I decorated the cupcake cake. Since Monika's birthday party was still a week away, I figured we'd just eat both of the cakes, but Monika wanted to save the cupcake cake for her party, so I wrapped it up and stuck it in the freezer. 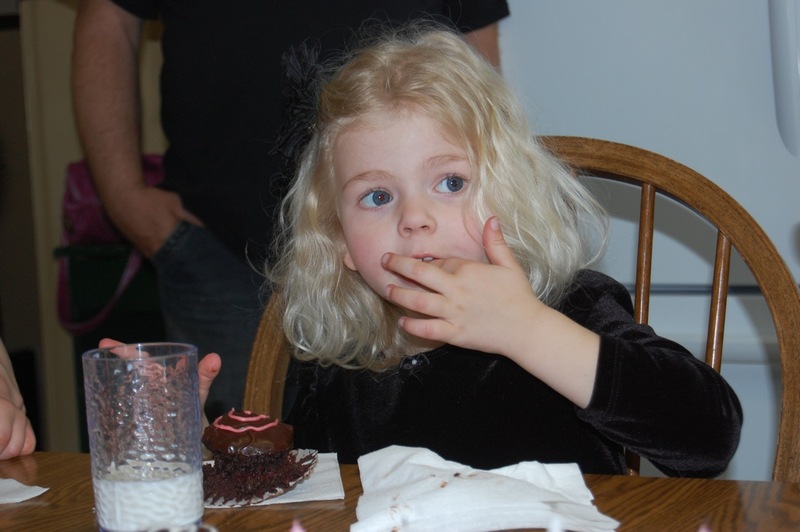 Since the cake was already made and decorated, I had a little extra time to decorate the cupcakes for the party. I used the same frosting recipes as I did for the cake, except I dipped the cupcakes in the frosting, instead of spreading it. The cupcakes were made using my recipe for Triple-Chocolate Berry Bars (recipe below). A double batch of the bar recipe made 36 cupcakes with a little batter leftover. 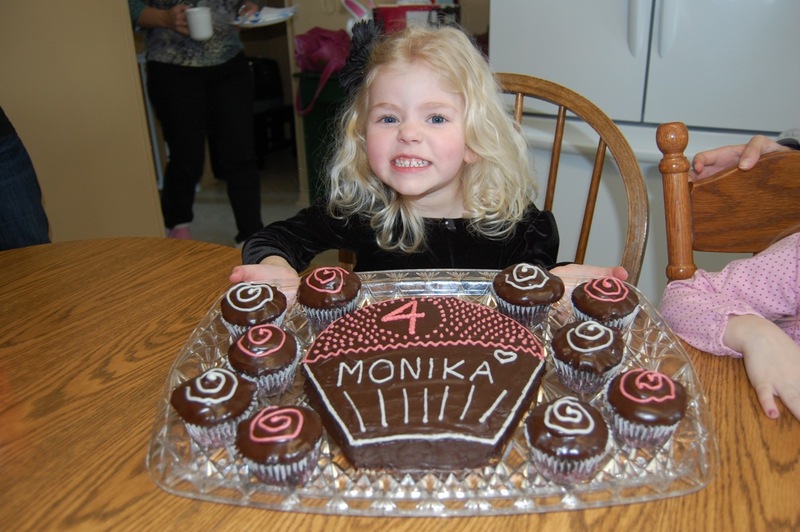 Everyone at Monika's party loved the cupcakes, but, even more important for me, Monika loved her cake and cupcakes, too. I found the original version of this recipe in one of our Penzeys Spices catalogs. But since I don't always have heavy cream on hand (or enough of it), I've come up with several substitutions. It always turns out great! In a small pot, heat cream (or whatever combination of dairy ingredients you're using) over medium-high heat, stirring frequently, just until small bubbles start to form. Remove pot from heat. Add chocolate chips and swirl pot a couple times to combine chips and cream. Let set for five minutes to allow chips to soften. Stir until chips dissolve and frosting is smooth. Let frosting cool and thicken, stirring occasionally, before dipping cupcakes or frosting cakes. This recipe was inspired by one I found on the back of a bag of Hershey's chocolate chips. I like it for decorating because it sets up nicely after applied. Beat butter in medium bowl. Add powdered sugar alternately with milk. Add more milk, if necessary, to achieve desired consistency. Stir in vanilla or other flavoring. This is my favorite variation of Betty Crocker's Triple-Chocolate Cherry Bars. I brought these, made as cupcakes, to our neighbor last spring and his wife emailed me that night to get the recipe. Preheat oven to 350°F. Grease (with butter) and flour a 9 x 13 pan. (I use some of the dry cake mix to flour the pan.) Or line cupcake tins with paper liners. In large bowl, beat eggs. Then blend in pie filling. Gently mix in cake mix, salt and chocolate chips with rubber scraper, breaking up bits of dry cake mix by pressing with scraper. Batter will be really thick. Spread in pan and smooth out top with spatula. If you want cupcakes with a rounded top, you need to fill the cups at least ¾ full, because this batter doesn't rise very much. Filling the liners takes awhile because the batter is so thick and sticky. Bake until toothpick inserted in center comes out clean. 9x13 pan – 35 to 40 minutes. Cupcakes – about 20 minutes (depending on how full the cups are). Cool completely, then frost with Chocolate Fudge Frosting or other chocolate frosting. This is no April Fools Day joke. This really is our new name and our new look. I'm the type of person who likes to change things up even though they're working just fine. 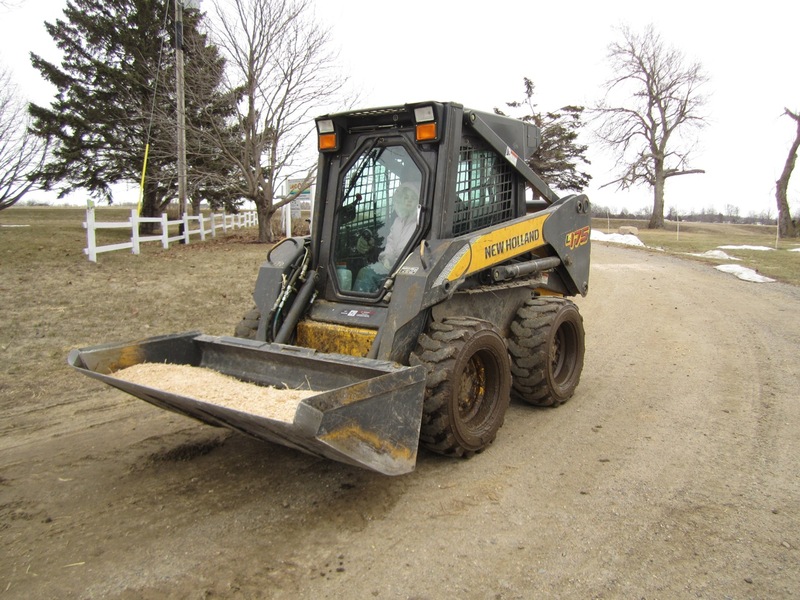 (Which, by the way, drives Glen nuts.) It's kind of like needing to rearrange the living room even though you didn't get any new furniture. This craving for change is probably one of the reasons I enjoy working with digital media. One of my jobs before we moved to Stearns County was designing web sites for a community newspaper. I don't do much design work anymore, but I still love it. I love the flexibility – nothing is etched in stone, there's no final draft. And I love the creative outlet. Now that we are a family of five, the header on our blog needed updating. This was one of the reasons I gave in to my craving for change. 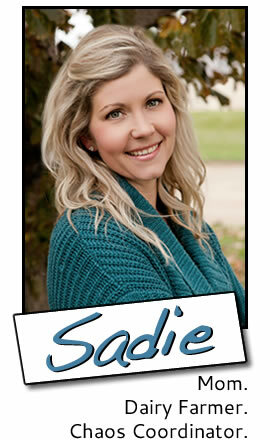 The other reason was that I've wanted a simpler, shorter name for our blog for quite awhile. Let's face it: Cows, Kids and a Little Bit of Chaos was a mouth-full. 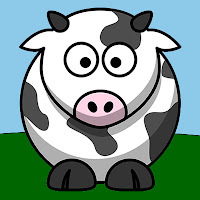 I thought about shortening our name to Cows, Kids and Chaos, but then I decided that it was time to focus on the good in our lives and not just on the chaos. 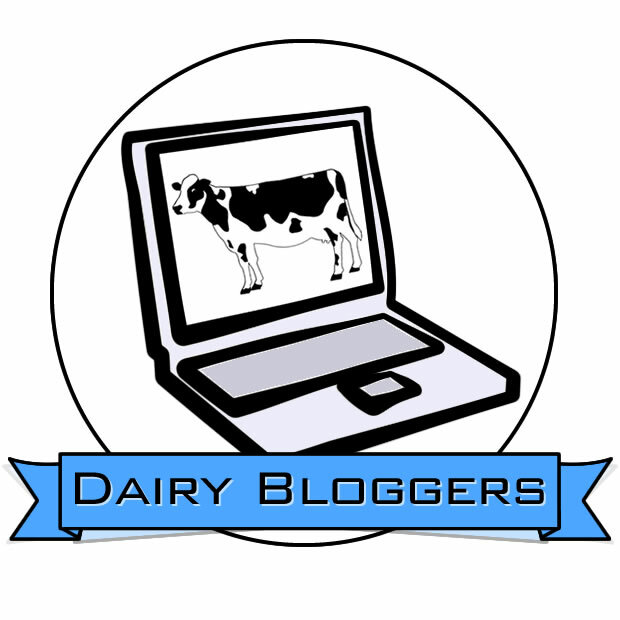 When I told Glen I wanted to rename the blog, he asked me, "Does that mean we're done with the chaos?" "The cows? The kids?" he bantered. We still have cows. We still have kids. Our life is still chaotic most of the time. But, despite the chaos, our life is a good life. Instead of focusing just on the chaos, I want to shine the light on what's good about this life. • If you haven't already noticed it, last month I added a page for the columns I write for the Dairy Star. • I also finally finished transferring all the posts from the old blog format, so if you use the nifty search feature (in the right column) you can search through every post I've ever posted. 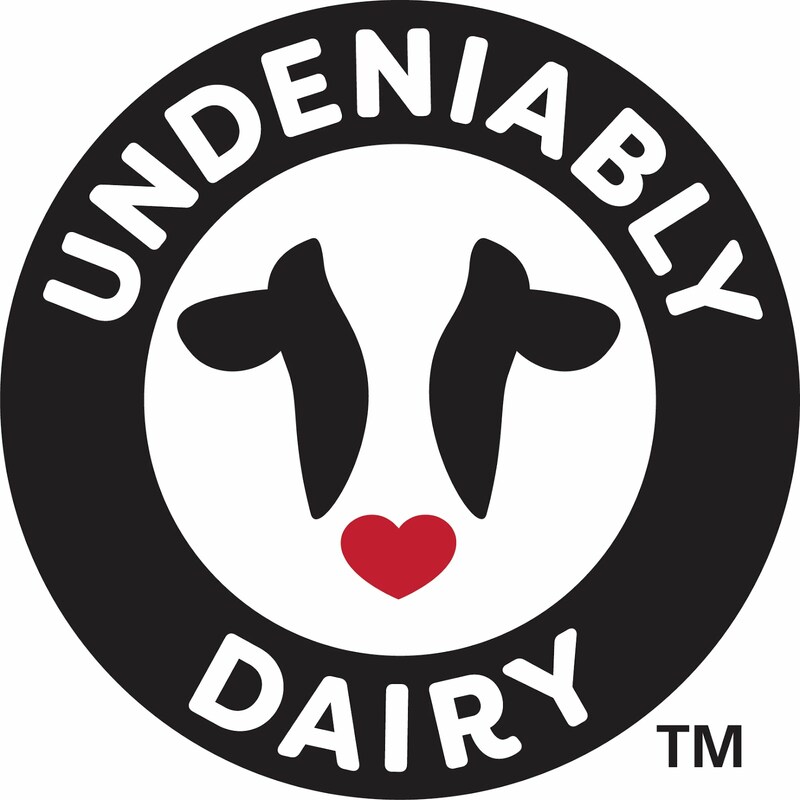 • Please update your bookmarks and news feeds with our new address: dairygoodlife.com. • You can also sign up to have new posts delivered by email. Just enter your email address under Follow By Email. I hope you like the new name and new look as much as I do. Thanks for following along!